Let's go make some fantastic potato salad! any bowl sufficient in size to contain the potatoes and the dressing. 3 medium pickles - diced to 1/8" to 1/4"
Hard boil (4) eggs, shell and clean them. In this instance it is preferable not to let them cool completely. 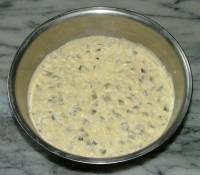 measure 7/8 cup mayonnaise into you r bowl. 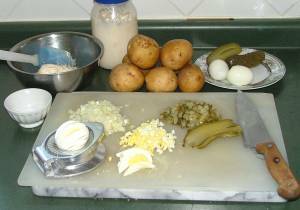 Dice your pickles and onions and add them to the mayonnaise. Gently stir in the ingredients until they are well blended. Potatoes are boiled in their jackets (unpeeled) so cover the potatoes, well, with water as it will boil away due to the longer cooking time. 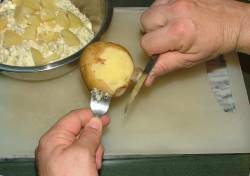 Potatoes should be boiled to firm - not too soft as they must maintain their form when cut into the dressing. In other words, don't over-boil the potatoes. Soft boiled potatoes do not work for potato salad. Turn off the water and take smallest potato out of the water to peel first. Gently fold mixture until potato is fully integrated into dressing - be sure not to break potatoes - they should stay in nice chunks. Taste and add salt a pinch at a time - stirring well (but carefully). Do not over-salt this dish. Salt can be added later if needed. Potato salad is best having sat in the refrigerator overnight giving time for the flavours to reach their peak. An energy saving tip for boiling eggs: place your eggs in a pot and cover them with water. Put a lid on the pot. Bring the water (with eggs in) to a full boil. Turn the burner off. Let the eggs sit in the water for 13 minutes - leave the pot covered. Experience will teach you how long to leave your eggs in the water to achieve your prefered level of "hardness". There are different types of potato salads. This is one of our favourites - we love the tang the full sour dill pickles contribute. We love the richness that comes from the egg. All around, it's not the only good potato salad but it sure is one of our favourites!! 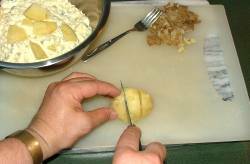 This Potato Salad recipe is adaptable to any number of potatoes you wish to prepare. It is prepared with egg - we like the texture and flavour that egg contributes to this. No special tools are required. Potato salad is an interesting and expressive dish to make. As with egg salad, potato salad is based on a gently flavoured foundation - that of the potato and is easily affected by the things you add to it. As you get comfortable with the recipe you can try tweaking and adding your own flavours.